Welcome to the 371st Penny Pinching Party! While you're here, help solve a kitchen organizing problem. Cassie commented on my Simple Solutions to Organize a Deep Pantry post and needs help with her kitchen and pantry. You guys are all so clever, so I thought I would post her pictures here and see if anyone else can give her some ideas. 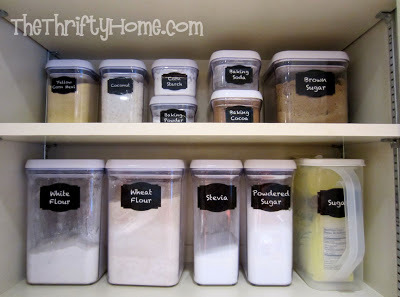 Leave a comment for Cassie or post a link of your organized kitchen and pantry (or both). 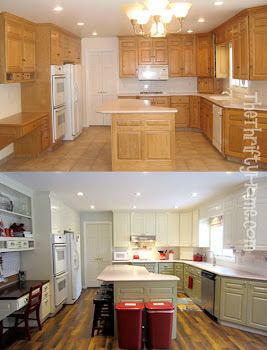 "My space is very limited in this kitchen and there are not other storage places in the kitchen. I am very good at organizing and have made the best of this situation but am becoming more and more irritated with the arrangement since my food is not all in the same area and things feel disconnected. Wondering, if you get this, what your suggestions would be as to how you would arrange the kitchen for optimum flow." I've posted my suggestions under the photos, but it's hard to tell the most useful place for things without being there. First thing: Dejunk everything and be very selective with what you keep. Get rid of the second microwave on the counter to free up some space. If the microwave above the stove is broken, check your local classifieds for a replacement. 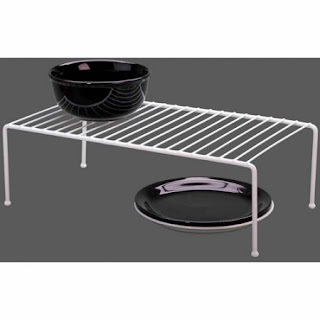 A shelf above the stove would be great for holding salt and pepper and other frequently used items for cooking. You can definitely fit another shelf in this bottom cupboard. Keep those lids in a drawer or your new top shelf and stack those containers to maximize space. You can fit so much more in this area. 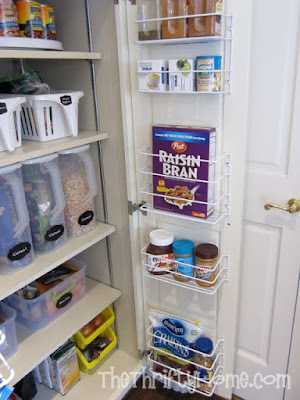 Take the canned food out of this cupboard and put it in the pantry area. Combine these 2 cupboards and put all of your frequently used cooking items in one of them and use the other for something else. 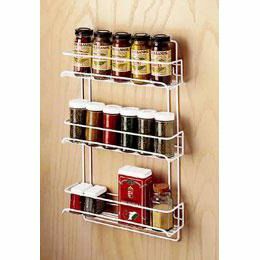 Add some inexpensive spice racks to the doors. Is that space to the right of the sink being used? If not, put some shelves in there and use it to free up that floor space under the window. I haven't posted about it yet, but I just organized all of my water bottles into a wine rack inside of my cabinet and I think that would be a great solution here. Also, put the food items in the pantry and keep this cabinet for glasses, cups, water bottles, and mugs only. It looks like this is the main pantry. I would take all non-food items out and keep this area food only. It looks similar to the before pictures of my pantry, so I think some shelves on the door might work here too. I would put items you don't use very often in the top space. Those knives should be out on the counter since you probably use them everyday. I'd also put the cutting boards in the bottom shelf next to the sink near the knives. After photo of my pantry after cutting back the shelves and adding shelving to the door. Here's another space that could use a shelf to add more storage. You could fit some of those appliances that are currently in the pantry area. Put taller items like pitchers here to utilize this space better or add another shelf. I keep jars in a basement storage room, but if you don't have any extra space in your house, I'd be more selective and only keep a few. Can that spot by the cat fit some shelves? Can you add another shelf to this cabinet? 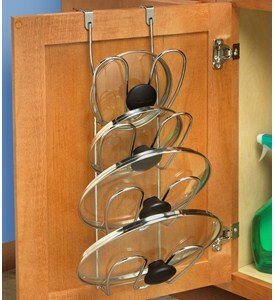 What about a lid storage rack like this? Can you tell that I like shelves? Don't try and tackle everything at once or you will get overwhelmed. Choose one area at a time to organize and you'll get there. My kitchen is very organized, but it took me a few years to figure out where I like everything. I wish I could come and help in person, I love organizing. That cheap Walmart shelving does wonder with storage. I've used them in all my lower cupboards that don't have built-in shelves. I've even stacked one in front of the other in some cupboards (like the one I use for pans), and it's amazing how much more storage it gives me. 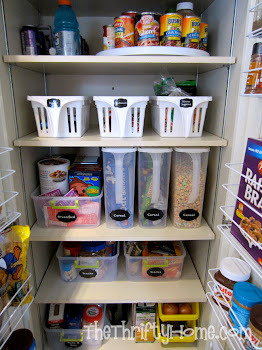 Yes, stack the plastic containers and keep the lids stacked together. 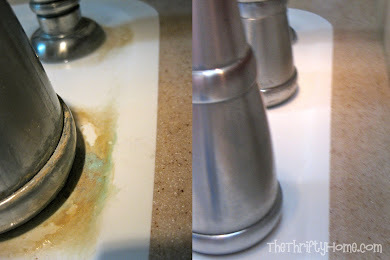 Also, use a dish drainer that's meant to fit inside the sink to get that off the counter. I'm presuming a new dishwasher is going into the empty slot. Otherwise, utilize that for some shelving. Do you have another area - maybe a basement - where you could store some of your small appliances? I don't use my slow cooker, bread machine or waffle maker every week, so those are stashed in my basement. Put all the canned goods in the same area, too. I also see small food packets/mixes/vitamins that could be stashed together in small bins/baskets inside the cupboards. Just some thoughts! Thank you so much for the suggestions. I do want to add that all of the base cabinets have a shelf in them and there is stuff on those shelves too. We have all new appliances coming the end of the month so the non working microwave will be gone as will the countertop one. Also the dishdrainer will be gone and the space between the sink and fridge will house a new dishwasher. The area by the cat is tricky as that door is rarely used but opposite that door (behind the cat) is our basement stairs. I used to have the toaster oven and the working microwave flanking the stove but decided I wanted more workable space there. Also do you have double deep of things in the deeper cabinet? I really dislike having to move one thing out to get something out from behind it. Yes, I use double deep shelving in my deep lower cabinets - one stacked in front of the other. However, I make sure the items I use most often are stacked in front. I think we all have our favorite go-to pans of various sizes. Those are in front. I put our vitamins/prescriptions in drawers now, but I used to have them in an upper cupboard. They were organized in bins that could be easily pulled out of the cupboard. Since you do have a basement, I would put as many of the little used small appliances down there to free up space in your cupboards, on your counters and on the top of your refrigerator. Congrats on the new appliances coming! Thank you so much for all the suggestions and thoughts. I have finally managed to figure out my kitchen. I will be taking pictures as soon as I can figure out how to do before/after and as soon as my new appliances are in. I am beyond thrilled with the new setup.